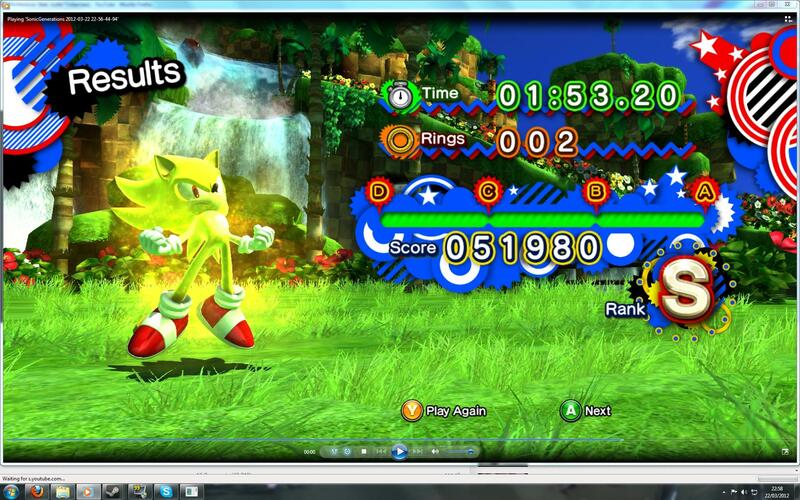 The Mario & Sonic Center > Forum > Sonic Central > Competition Central > Sonic Generations Challenges! This is a bit of a wild shot in the dark, as it has been literally years since we had a successful one of these; but I'm hoping the fact that Generations is a) new, b) good and c) has quickly garnered a lot of competition here compared to most recent releases, means that we can get one of these threads rolling and have some good old fashioned fun. Any and all players of all skill levels are welcome to participate! Naturally this is a competition, but the aim above all, as mentioned, is to have some fun. These challenges will have you performing various, unconventional tasks within levels. According to how well you do, you are assigned a letter rank and then awarded a number of points. There are two types of challenge: Fixed Rank and Competition. Fixed Rank has set boundaries for each Grade, whilst Competition is an 'every-man-for-himself' type affair, where the best player gets the top rank. All challenges are to strict deadlines, no allowances will be made unless a genuine reason is given in advance. For example, Player A will be out of town for a week, and will miss a challenge. If they inform me in advance, they can have a little extra time after the deadline of the challenge to 'catch up' and do the challenge. No other exceptions will be made. You have been warned. Challenges will last for exactly four days after the time of posting; the exception is this first challenge, which will last for seven days instead. Challenges will typically have participants perform X, with various restrictions. Naturally, breaching these restrictions invalidates the stat. - You must have the Boardmaster skill equipped. - You must activate the skill as soon as the level starts. - You must remain on the skateboard until after you reach the red spring that launches Sonic to the wooden loop that leads into the final section. Losing the skateboard before this point in the level caps your rank for the run to a maximum of a B. For additional clarification, this is the spring next to the Crabmeat, and just after two ring monitors and one life monitor. Extra note, you can go over the top and miss that spring entirely, and your stat is fine. S Rank: Finish in under 1 minute. A Rank: Finish in under 1 minute 5 seconds. B Rank: Finish in under 1 minutes 10 seconds. C Rank: Finish in under 1 minutes 20 seconds. D Rank: Finish in under 1 minutes 35 seconds. E Rank: Anything over 1 minutes 35 seconds. The deadline for this challenge is exactly one week from the posting time of this post, and I will add submitted stats, as well as the rankings to this post when appropriate. the aim above all, as mentioned, is to have some fun. Finally a challenge in which I can participate. That's nice, RPG! Lost the board to a massive wooden loop glitch. Looking forward for more! Just a reminder to all would be entrants that there is just over three days remaining for this challenge! The current challenge has 12 hours remaining. After this, I will be adding the current overall rankings to this post, and then adding the next challenge in a new one! Challenge #2 - Green Hill Modern - Orange Maser Emerald!? - You must have the Super Sonic skill equipped. - You must transform into Super Sonic before the clock hits 45 seconds. - You must remain as Super Sonic until you finish the level. This is a Competition Challenge, so fastest time wins! Just to confirm, are we allowed to keep retrying and resubmitting until time is up? ^Well, RPG just did, so. Speaking of time, would you guys prefer if challenges started lasting for four days from this point on, as originally intended, or would you prefer if each one lasted for a week? The second one looks like one I could do, since I've been messing around with the Super Sonic skill a lot. People can join in at any time they like! Seems to be the best I can do for now.